With an immense increase in vape shops all across the US, it’s especially important for each brick & mortar location to display some of the best traits this industry has to offer. Vapor Station is one of the many stores within the Ohio area, but it’s considered one of the best vapor stores in the state. Due to its wide selection of vapor products, the many features that set it apart from the rest, and a slew of locations all around the city capital, it has become the premier vapor store in the midwestern state. Stretching from Columbus to Gahanna, the Vapor Station offers a variety of locations in the Ohio area, with up to five stores in its arsenal. Whether you’re in Columbus, Hillard, Circleville, or Gahanna, there’s always a physical Vapor Station store nearby to meet your needs. Its Vapor Store Hillard, OH and Vapor Store Gahanna, OH store has become especially popular among locals, as it offers a wide selection of the vaping industry’s most popular products in the two high traffic cities in Ohio. And, having a great location isn’t all that differentiates these stores from the others, it’s the great attention to detail when it comes to presenting a clean and professional environment for its customers. Additionally, there are added benefits and perks that have allowed Vapor Station to gain so much success, like dedicating every Wednesday as ‘Liquid Day’, where customers can take advantage of fantastic sales on house juice. While its premium juices are exceptionally delicious, its house juices deliver great quality, a remarkable taste, and has been priced to be very affordable. It’s just one of the many things that make the Vapor Station such an awesome vapor store to shop at in the Ohio area. 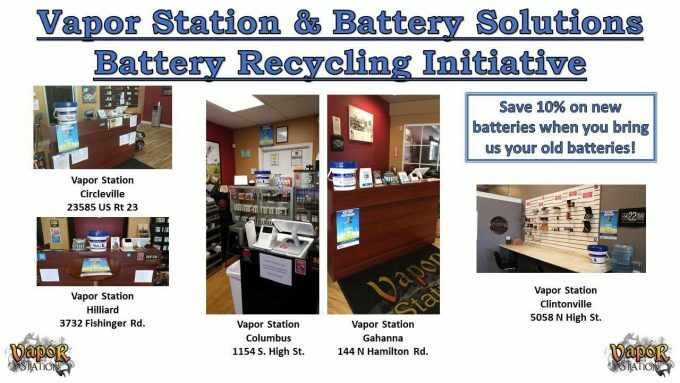 Another impressive key point to the Vapor Station store’s is that each of the five locations has a place in a position where you can recycle your old batteries. When you recycle those old, drained batteries, you will receive 10% off new batteries. Not only are you going green by doing your part and recycling batteries, but you’re also saving yourself money in the process when you replace them with a new set. These stores have seen great attention from locals with their Battery Recycling Program, and we’re sure the rest of US thinks highly of them as well for their contribution to help protect the environment. Recycling is very important, since waste has a huge negative impact on the natural environment, and Vapor Station is providing a way for vapers, specifically, to do their part by recycling their old batteries. While each of the five locations has received an excellent track record, its Vapor Stores Columbus Ohio location has gained the most notoriety due to its marvelous space, huge selection of the industry’s latest and greatest vapor productions, and since it rests right in the heart of Ohio. In addition to it residing in Columbus, the capital of Ohio, it’s a gathering place for all vapers in the area. The comfortable atmosphere and friendly staff is the cause for a fantastic shopping experience. If you’re in the Ohio area, feel free to check out the Vapor Station Columbus website and navigate to its locations page, where each location has an address displayed, along with its own individual page that shares its phone number, hours of operation, and pictures of the location. To learn more about the Vapor Station and its five locations, feel free to visit VaporStationColumbus.com.